If I had a nickel for every bank or credit union exec that told me their institution pursues a “fast-follower strategy” when it comes to technology, I’d be on the Forbes Richest People list. Since many of the execs who tell me this are either clients or prospects, however, I have to hold my tongue, and refrain from telling them that they’re spewing nonsense. 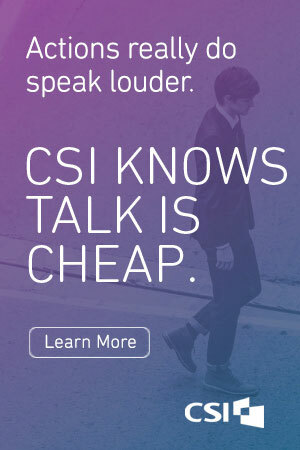 But since you know that what they’re doing is anything but fast-following, we can talk about it here. Why it’s nonsense: First off, being a “later mover” doesn’t make you a “fast-follower.” Nowhere in the article or the research it cites is there any mention of when the later movers moved. More importantly, “failure rate” is not the appropriate metric. The 53% of the first-movers who did succeed may very well have earned fantastically high rates of return on their investments, and captured market share that was never lost to the later-movers (feel free to call them fast-followers if you’re so deluded). What did the later movers get? They may not have “failed,” but did they generate the same returns as the first entrants? Did they gain meaningful market share? Did they capture profitable segments of the market? Without answers to these questions, relying on the “rate of failure” is misleading. Why it’s nonsense: The false premise here is that a fast-follower is making a choice to not launch a particular technology before others do, in order to wait for others to make mistakes, or in order to learn more about customer problems. Did the developers of Google’s search engine technology have everything ready to go back in 1998? Did they consciously sit back and say “hey, let’s let these bozos from goto.com launch first and fail, so we can swoop in and learn from their mistakes”? I don’t know. Maybe they did. But I doubt it. It’s disturbing how many articles on this subject quote that “47% of first-movers fail” statistic. I’ve heard that 95% of new products and new startups fail. I guess no one should ever launch a new product or start new company then, eh? And how come no one ever says “53% of first-movers succeed”? I would argue two things: 1) There isn’t a single good example of a bank that has successfully executed a “fast-follower” strategy in the past 20 years; and 2) Even thinking about pursuing a “fast-follower” strategy is a stupid endeavor. The first point is easy to defend. When it comes to digital technologies — online and mobile — the rate of adoption among banks and credit unions is so similar that no one can really claim to have consciously and deliberately pursued and executed a fast-follower strategy. In addition, an overwhelming percentage of banks and credit unions that have deployed digital products and services available (e.g., online/mobile banking, online bill pay, eStatements, etc.) have done so at the speed with which their vendors have offered those services. Or slower. To further prove my point, can you name one financial institution that has achieved any sustainable gains in market share or profitability as a result of being the 2nd bank to launch a particular technology? I didn’t think so. And why is even thinking about a fast-follower strategy stupid? A successful business strategy involves understanding the needs of a particular segment (or segments) within a market, and better serving those segments than the competition. If better serving a particular segment means being the first to market with a new technology, then being a fast follower is a stupid strategy. If effectively serving your chosen market segments doesn’t require the deployment of the latest technology — say, because those segments aren’t early adopters –then being a first mover and/or a fast-follower is a stupid strategy. It’s a better question, but it’s not the best question. 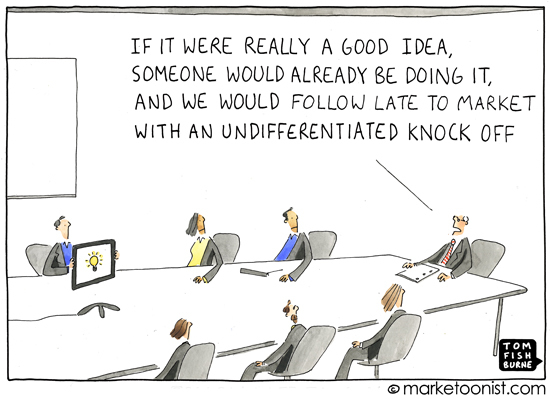 The best question to address is: Which idea [or technology] will be the breakthrough idea? For all the talk about disruption in financial services over the past few years, there has simply been no particular technology that has been developed that has given any financial provider a competitive edge by either being first or second to deploy. I’d like to see some proof of this retention impact, and some quantification of the so-called “value” in being first-to-market with new iOS features. Because I’m not buying this line of argument. Most consumers are simply not early-adopters. It’s a function of mathematics. Everyone can’t be the earliest adopters. Therefore, the majority of the market does not care about new features on day one. Therefore, being first to market — or even second to market — is not worthwhile. The real question that needs to be answered is: When does your target market want or need it? An agile, rapid planning process that took in the inputs from the team in point #1 and made the quick the decision to fund the team from point #2. You don’t really think that describes your bank or credit union, do you? If after reading this, you still feel compelled to delude yourself into thinking that your bank or credit union is a fast-follower, that’s fine with me. But if you tell me you’re a fast-follower, I’m am going to call you out on your nonsense. This article was originally published on June 21, 2016 . All content © 2019 by The Financial Brand and may not be reproduced by any means without permission.